One final corner from Sebastian Rudy, and Benjamin Hübner rises highest to power the ball home with his head for the 90th-minute winner. The centre-back’s goal was the only one of the game as Hoffenheim downed Eintracht Frankfurt to jump back up to third in the table and into an automatic UEFA Champions League qualification spot. A minimum of fourth place is now secured for Hoffenheim, but they have a key match next weekend as they battle for third: a trip to Borussia Dortmund, who currently sit just one point behind the Sinsheim club. Julian Nagelsmann’s side are out to defend third place as they look to crown their best-ever Bundesliga campaign with a spot at Europe’s high table next season. A large part of this success is down to Hübner, who has formed a formidable defensive trio alongside Niklas Süle and Kevin Vogt after some initial difficulties. 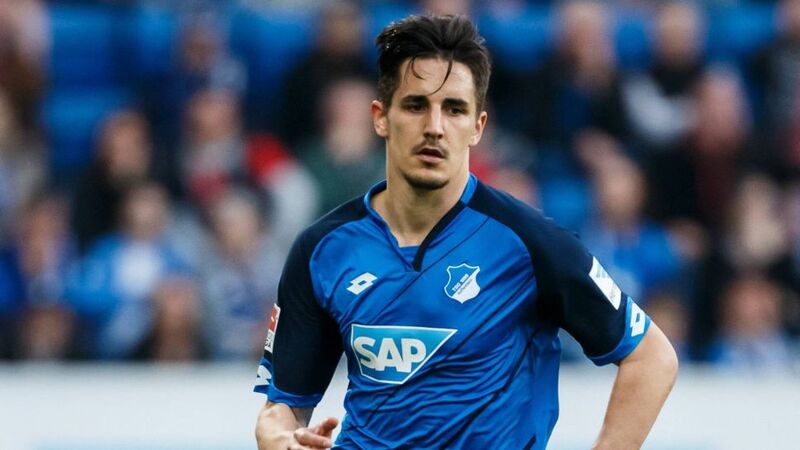 Following his transfer from Ingolstadt, Hübner first had to get used to the Hoffenheim way of playing, explained TSG coach Julian Nagelsmann. The youngest Bundesliga coach in history also joked that the 27-year-old "still isn’t a world champion in training, but maybe a European one." Nagelsmann has also explained that Hübner is not one to think about training, but to simply do it. The centre-back has football running through his blood with brothers Christopher (SV Wiesbaden) and Florian (Hannover 96) also professional footballers. Father Bruno, however, had his evening slightly spoiled by Benjamin’s late goal as he is the Eintracht sporting director. Frankfurt’s director of football Fredi Bobic even joked that the club would have to fire Hübner because of his son’s goal against them. After the game, bundesliga.com caught up with Benjamin Hübner to ask him about his father’s reaction to his goal, as well as the prospects for Hoffenheim against Borussia Dortmund. Question: Benjamin Hübner, how difficult was that game against Eintracht? Hübner: That was a tough match, but we got a set piece late in the day, and we’re always dangerous from them. The ball in was a good one, and I was able to get a good run onto it. Before I could even think about what I’d just done, the team was all on top of me celebrating. Question: Did you receive praise or a telling-off from your father? Hübner: He congratulated me on the win. Question: Do you think you might have damaged your relationship with him after that? Hübner: I hope not! No, he congratulated me on the goal, he’s still my father. Question: Your team has a habit of scoring key goals late on. Is it particularly stressful for you defenders when it’s 0-0 and everyone is still hoping for a late winner for either side? Hübner: Of course it’s important to keep a clean sheet for ourselves, especially in games like this against Frankfurt where the second half was so dogged. You’re always at risk of being caught on the counter, but we were alert and luckily were able to grab a winner with a late set piece. Question: You’ve been playing in a back three with Niklas Süle and Kevin Vogt for a long time now. How would you describe your interplay? Hübner: It’s improved from game to game. We’re tough to get past and play out from the back well. But the whole team tries to play out from the back – we have really good build-up play. I’m pleased with how things have gone with our back three and in the team as a whole. When you know what the player alongside you is doing, then that’s a massive advantage in defence. Question: You now go into the decisive game for third place and automatic Champions League qualification against Borussia Dortmund with a point advantage over your rivals. Hübner: Yes, we’re in a good position – that was our aim for the Frankfurt game. We’re well placed, are confident and know what we can do. Question: And you don’t want to let go of third place, right? Hübner: Why should we aim for anything else? Fourth place and a place in the Champions League qualifiers is secure, so our only remaining objective can be third. Question: Dortmund know that defeat could be the end of their fight for third place. Is that a psychological advantage for you then? Hübner: We are not under pressure, Dortmund are. We’re going to go there with their aim of getting something out of the game. Click here for more Hoffenheim news.